Disclaimer: This was my second time trying pizza! What?! Read my previous post about Costco pizza, and that should clear things up haha! 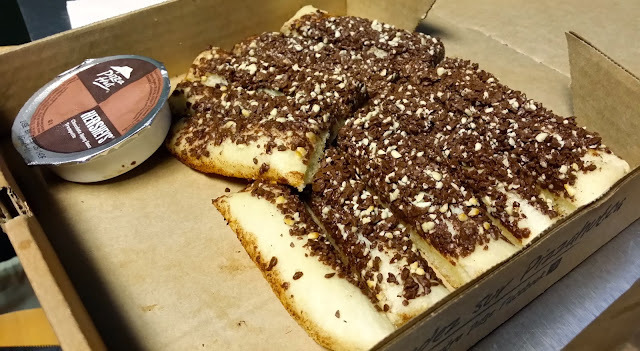 Growing up, I've always wanted to try Pizza Hut, and I finally realized my childhood dream today. I was super excited about going to Pizza Hut for the first time! They had an promotion for a personal pizza for $3.99. I went with Pepperoni. The wait time for take out was about 10 mins, which wasn't too bad. The first thing I observed was that the dough was soaked in oil. The cheese was gooey and wasn't too salty. 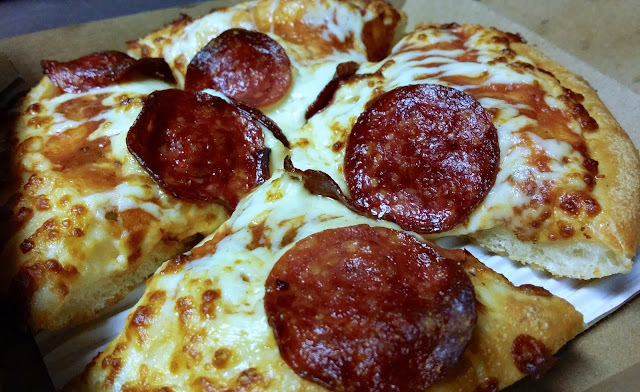 The pepperoni was crispy and the crust was springy and soft. 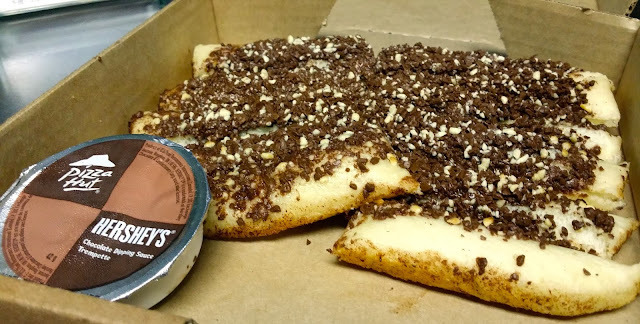 I was super excited about trying the Hershey's Chocolate Dunkers when I first heard about them, as you know I'm a sucker for anything chocolate and sugary! The fact that it was in bread form made it even better hehe. I was expecting about 5 pieces, but I was shocked when I opened it, there were 10 pieces in there! I ended up consuming about 4 pieces haha. They were piping hot, and the chocolate was slightly melted. It's essentially made out of pizza crust, that is covered in dark/white chocolate chunks. The dough was actually slightly salty from the oil which actually complimented the sweetness of the chocolate. The dough was crispy on the bottom and saturated in oil. The sticks were really sweet on their own, but the part that sold me was the Hersey's Chocolate Dipping Sauce. The sauce wasn't overly sweet, and was actually warm, probably from the being in the box. The verdict: The pizza was tasty, but wasn't exceptional. The Chocolate Dunkers on the other hand, was heavenly! If you're a chocolate enthusiast like myself, then you'll love this!